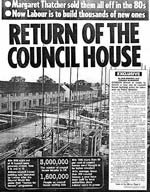 Articles in the national press report that Gordon Brown intends to build a new generation of council homes (see Press Archive). Book now to attend the DCH national conference on July 12 to help refine the detail of our demands and organise to kill off any attack on our lifelong secure tenancies or introduce means testing. We want to recreate council housing as decent, affordable, secure and accountable housing that all can be proud to live in - not a stigmatised transit camp for only the most desperate. DCH has produced 'Ten Questions to Candidates' for those standing in the Labour Party leadership elections. Circulate the questions to everyone who has a vote and distribute at any hustings meetings.